Sir Arthur John Gielgud OM CH (/ˈɡiːlɡʊd/; 14 April 1904 – 21 May 2000) was an English actor and theatre director whose career spanned eight decades. With Ralph Richardson and Laurence Olivier, he was one of the trinity of actors who dominated the British stage for much of the 20th century. 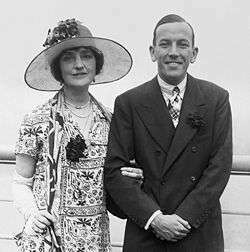 A member of the Terry family theatrical dynasty, he gained his first paid acting work as a junior member of his cousin Phyllis Neilson-Terry's company in 1922. 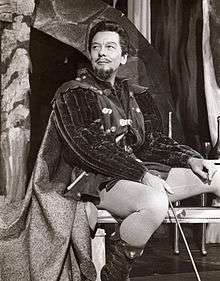 After studying at the Royal Academy of Dramatic Art he worked in repertory theatre and in the West End before establishing himself at the Old Vic as an exponent of Shakespeare in 1929–31. During the first half of his career Gielgud did not take the cinema seriously. Though he made his first film in 1924, and had successes with The Good Companions (1933) and Julius Caesar (1953), he did not begin a regular film career until his sixties. Between Becket in 1964, for which he received his first Oscar nomination, and Elizabeth in 1998 he appeared in more than sixty films. As the acid-tongued Hobson in Arthur (1981) he won the Academy Award for Best Supporting Actor. After Hillside, Lewis and Val had won scholarships to Eton and Rugby, respectively; lacking their academic achievement, John failed to secure such a scholarship. He was sent as a day boy to Westminster School,[n 2] where, as he later said, he had access to the West End "in time to touch the fringe of the great century of the theatre." 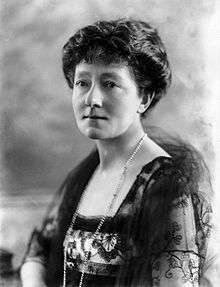 He saw Sarah Bernhardt act, Adeline Genée dance and Albert Chevalier, Vesta Tilley and Marie Lloyd perform in the music halls. The school choir sang in services at Westminster Abbey, which appealed to his fondness for ritual. He showed talent at sketching, and for a while thought of scenic design as a possible career. In the first half of the decade Gielgud made seven films and six television dramas. Morley describes his choice as indiscriminate, but singles out for praise his performances in 1974 as the old Cardinal in Joseph Losey's Galileo and the manservant Beddoes in Sidney Lumet's Murder on the Orient Express. In a 1971 BBC presentation of James Elroy Flecker's Hassan, Gielgud played the Caliph to Richardson's Hassan. The critic of The Illustrated London News said that viewers would "shiver at a towering performance by Gielgud, as a Caliph with all the purring beauty and ruthlessness of a great golden leopard." 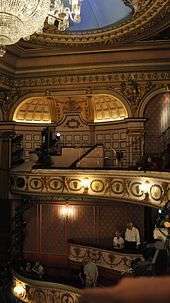 In the theatre Gielgud directed Coward's Private Lives and Somerset Maugham's The Constant Wife (both 1973, London and 1974, New York). His final production as a director was Pinero's The Gay Lord Quex (1975). In the 1980s Gielgud appeared in more than twenty films. Morley singles out as noteworthy The Elephant Man (1980), Chariots of Fire (1981), Gandhi (1982), The Shooting Party (1984) and Plenty (1985), directed by David Lynch, Hugh Hudson, Richard Attenborough, Alan Bridges and Fred Schepisi respectively. Tony Palmer's Wagner (1983) was the only film in which Gielgud, Richardson, and Olivier played scenes together. 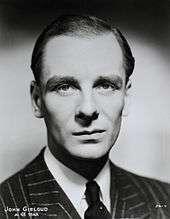 [n 20] Gielgud made cameo appearances in films of little merit, lending distinction while not damaging his own reputation. He told an interviewer, "They pay me very well for two or three days' work a month, so why not? It's nice at my age to be able to travel all over the world at other people's expense." ↑ Croall, Jonathan (2012). John Gielgud: Matinee Idol to Movie Star. Bloomsbury Methuen Drama. p. 632. ISBN 1408179458. Croall, Jonathan (ed) (2013). 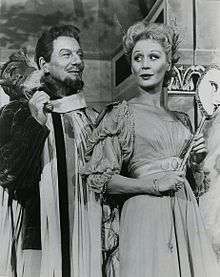 Gielgoodies – The Wit and Wisdom and Gaffes of John Gielgud. London: Oberon Books. ISBN 1783190078. 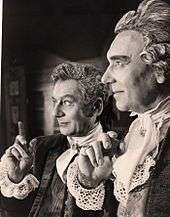 Gielgud, John; Richard Mangan (ed) (2004). Gielgud's Letters. London: Weidenfeld and Nicolson. ISBN 0297829890.